Human sperm compete to fertilize an egg. A study published in Science this week hints at a new, reversible means of blocking male fertility. This week, researchers in Japan report a reversible way to control male fertility. Using two drugs already on the market, they rendered male mice sterile. One week after the drugs were removed, the mice regained fertility. Contraceptives for women have been available since the 1960s, but only the condom is available for men, so the results may be a big step toward long-sought equalizer between the sexes. "It is important to develop male contraceptives not only to give men control over their own fertility but also for better equality between men and women," senior author Masahito Ikawa, a professor at Osaka University, wrote to The Why Files. "In the U.S.A., for example, nearly 50 percent of pregnancies are unplanned," he added. "Contraceptives for women are based on women’s hormonal cycles, but for men this solution does not really work." Both drugs -- cyclosporine A and FK506 -- are immune suppressants, used to block rejection of organ transplants. They work by inhibiting the compound calcineurin, which activates the T-cells in the immune system. 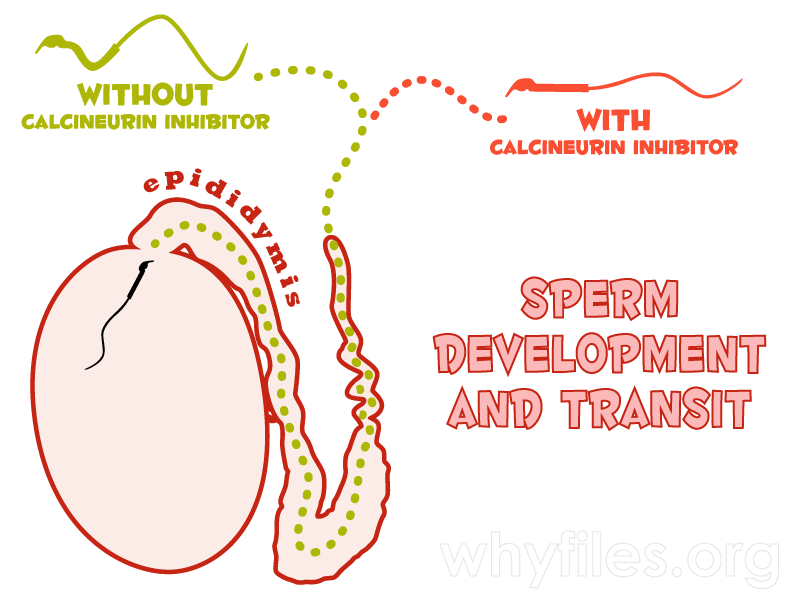 Calcineurin also plays a role in sperm maturation inside a squiggly tube called the epididymis. Ikawa and his colleagues found that the twin drugs tested in the study impair that maturation. In the presence of the drugs, maturation is abnormal, rendering the whip-like flagella, or tail, that normally propels sperm to fertilize the egg abnormally stiff. 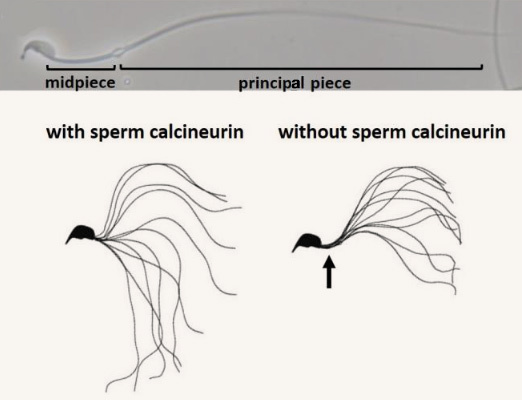 During the transit of sperm through the epididymis, calcineurin promotes normal tail flexibility. When the researchers reduced levels of calcineurin in sperm, the flagellum was stiff, preventing the sperm from fertilizing an egg. Sperm may spend two to three months in the human epididymis, which is six to seven meters long. As a side-effect, the anti-rejection drugs reduce sperm movement, Ikawa says. "The dosage is enough to impair sperm motility but it is not enough to render men infertile." However, in the high-dose rodent tests used to test toxicity, both drugs can reduce fertility. What is the mode of (in)action? The impaired movement was a key. Although sperm production was not impaired, the drugs affected a maturation process that occurs in the epididymis, a tube where sperm gather after being produced in the testes. As a result, the whip-like flagella were abnormally stiff, depriving the sperm of normal movement. Hobbled, they were unable to penetrate the zona pellucida around the egg, a necessary prelude to fertilization. The midpiece of the sperm tail contains the sperm’s mitochondria and operates the movement of the tail. When sperm are deprived of the chemical calcineurin, the midpiece becomes more rigid and adopts a hook-like shape that constricts the tail’s range of motion. We observed that mice are not people, and asked how the results might transfer to human contraception. "Mice are very similar to humans in their reproduction," Ikawa wrote to us. "A lot of the genes involved are conserved, meaning mice and humans are similar genetically." Because cyclosporine A and FK506 impair human immunity, their contraceptive capacity cannot be tested in people, he added. "Therefore we use mice to model the effects of these drugs on a reproductive system very similar to our own." Both physiological and social reasons explain the absence of a male contraceptive, Ikawa wrote to us. "Developing contraceptives is notoriously difficult -- it is the only form of medication given to a completely healthy person … so the number of side effects has to be extremely low, much lower than is acceptable for any other medication." Men of reproductive age make millions of sperm, while women release one egg per month, he wrote. 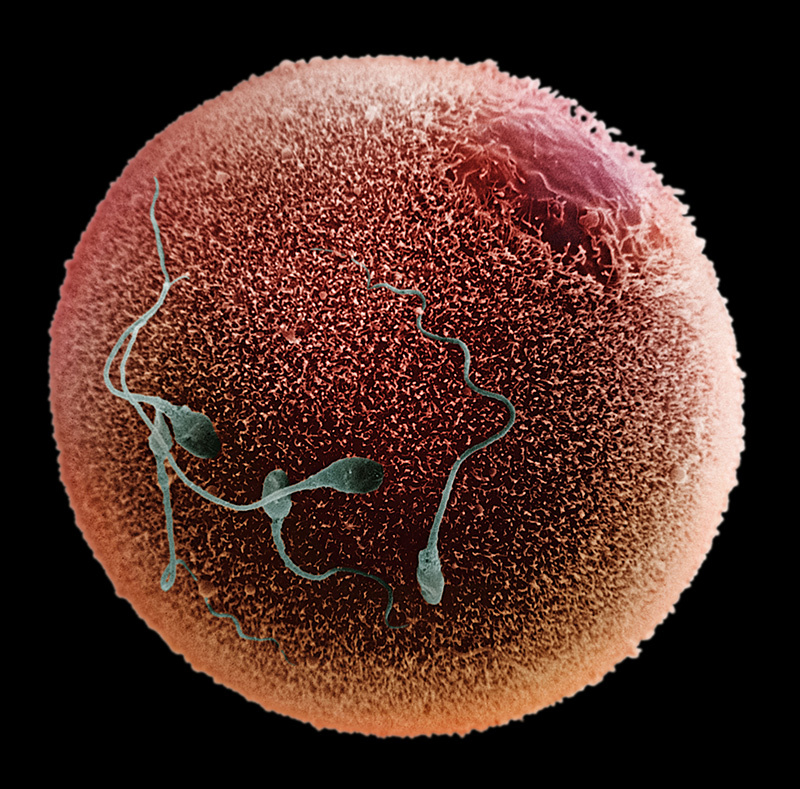 "This makes the target a lot harder to hit (so to speak), and is also why a lot of research into male contraceptives is focusing on the development of the sperm before it is released, as seen in our study." Another factor is the fear "that contraception will render a healthy man infertile," Ikawa wrote. "Even though the goal is to make this reversible as with women’s contraceptives, it is still a large obstacle for many men to come to terms with." The unmet need for contraception is highest in Africa and South Asia -- exactly where the population explosion is concentrated. A reversible male contraceptive could help families chose how many children to have. Map from United Nations Department of Economic and Social Affairs, 2013. If researchers can find a drug that mimics the mechanism exploited in the new study but does not affect the immune response, it could be delivered as a pill or an implant that releases a steady dose, Ikawa says. "As our understanding of these reproductive processes increases the methods we can give to men and women to control their own fertility will increase as well." Size of Sperm: Is Bigger Better?